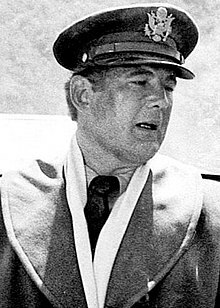 David Allen Ogden Stiers (October 31, 1942 – March 3, 2018) was an American actor, director, singer, musician, conductor, voice artist, and comedian. He was most famous for his role as Charles Emerson Winchester III in M*A*S*H. He also provided the voices in several Disney animated movies. This included playing Cogsworth in Beauty and the Beast, John Radcliffe in Pocahontas, and Jumba Jookiba in the Lilo & Stitch franchise. He also played the voice of Escher in the Myst V (End of Ages) video game. Stiers was born in Peoria, Illinois on October 31, 1942. He attended Urbana High School at the same time as Roger Ebert. He went to Eugene, Oregon, where he graduated from North Eugene High School and attended the University of Oregon. Stiers was openly gay. He was a Democrat. On March 3, 2018, Stiers died at his home in Newport, Oregon of bladder cancer-related complications at the age of 75. ↑ "David Ogden Stiers Unofficial website – David Ogden Stiers Fan Tribute site". ↑ "Five Questions With David Ogden Stiers". USA Network. Archived from the original on November 3, 2005. ↑ "'M*A*S*H' Star David Ogden Stiers Reveals He's Gay". ABC News.com. May 6, 2009. Retrieved October 5, 2013. ↑ Bergan, Ronald (2018-03-11). "David Ogden Stiers obituary". the Guardian. Retrieved 2018-09-27. ↑ "David Ogden Stairs". Celebrity NetWealth.com. Archived from the original on January 8, 2013. Retrieved October 5, 2013. ↑ Campuzano, Eder. "David Ogden Stiers, 'M*A*S*H*' star and Newport resident, dies at 75". The Oregonian. Retrieved February 3, 2018. This page was last changed on 26 January 2019, at 23:32.